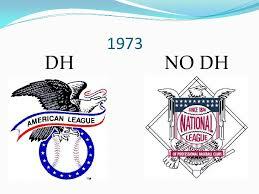 In a shocking departure from previous positions, both Major League Baseball and the Players Union (MLBPA) may soon agree on the adoption of a Universal Designated Hitter Rule—wiping out the stupidity of pitchers hitting in the National League (and in inter-league games in NL parks). There are other rules being seriously considered as well—like a three-batter minimum for each pitcher—but it's the DH news that is truly exciting. Moreover, multiple reports suggest that the Universal DH might actually happen as early as this season. This could be the best thing to happen to baseball since Mookie Betts broke into the league. Another intriguing possible new rule change—proposed by the union—would be for teams' draft positions to be lowered if they do not win a certain number of games during two straight seasons. Clearly, this would be an attempt to correct the obvious hesitancy of team owners to spend big on long-term free agent contracts for the likes of Bryce Harper and Manny Machado—not to mention the hundred or so other un-signed free agents. Stay tuned!